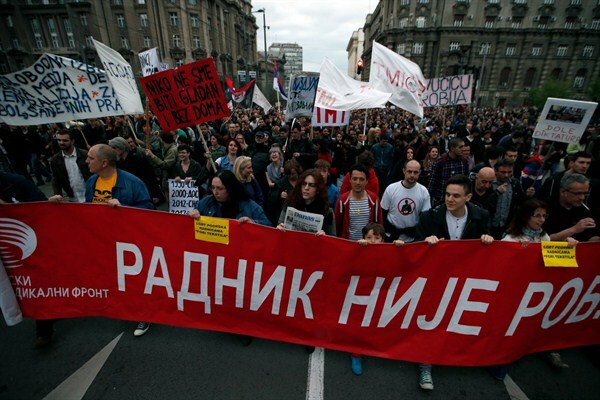 Serbia’s Post-Election Protests Broaden, but Can They Make a Difference? Protesters march holding a banner that reads "The worker is not a slave!" during demonstrations against the presidential election victory of Aleksandar Vucic, Belgrade, Serbia, April 11, 2017 (AP photo by Darko Vojinovic). BELGRADE, Serbia—Tens of thousands of Serbians have taken to the streets in recent days to protest the victory of current Prime Minister Aleksandar Vucic in the country’s presidential election on April 2. The demonstrations also reflect widespread economic and political dissatisfaction as well as divisions in the country, and present a challenge to the European Union’s approach to the Western Balkans. Brussels is increasingly seen in some quarters as promoting stability over deep reform in the combustible region, allowing strongmen to erode democracy and independent institutions.